UFO SIGHTINGS DAILY: China Will Soon Contact Aliens, Almost Finished With The World Biggest Radio Telescope, July 2016, UFO Sighting News. China Will Soon Contact Aliens, Almost Finished With The World Biggest Radio Telescope, July 2016, UFO Sighting News. In America, and around the world radio telescopes are being used to see and hear possible signals of alien life from across the universe. However there is another use, one that you might not be aware of. A radio telescope can send a message through spaces at the speed of light across the universe. China now has what it needs to make direct contact with aliens, gain their technology, and make friends with a very powerful off world species. Now you know the true reason why China was in a rush to build this. 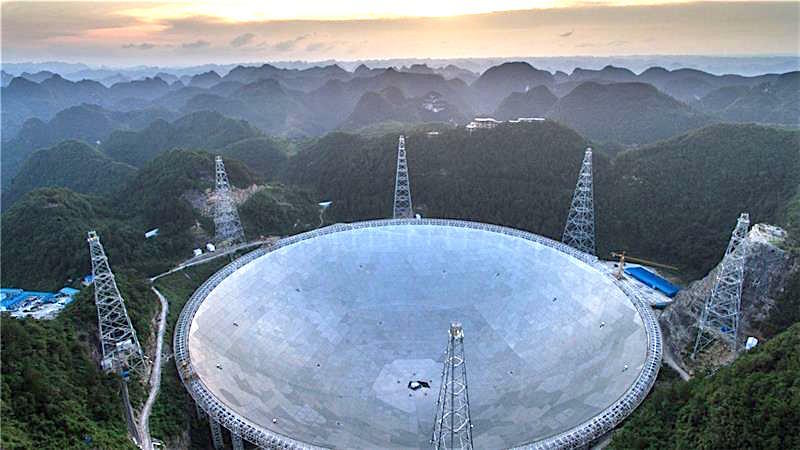 China has put the final piece of what is set to be the world's largest radio telescope in place, state media have reported. The "Five-hundred-metre Aperture Spherical Telescope", or FAST, is the size of 30 football fields and has been hewn out of a mountain in the southwestern province of Guizhou. "The project has the potential to search for more strange objects to better understand the origin of the universe and boost the global hunt for extraterrestrial life," Zheng Xiaonian, deputy head of the National Astronomical Observation under the Chinese Academy of Sciences, which built the telescope, said on Sunday. The $180m radio telescope would be a global leader for the next one to two decades, Xiaonian was quoted as saying by the official Xinhua news agency. A number of trials will follow the hoisting of the final piece on Sunday. The telescope, which took about five years to build, is expected to begin operations in September. China's space programme has been a priority, with President Xi Jinping calling for the country to establish itself as a space power. Beijing's ambitions include putting a man on the Moon by 2036 and building a space station - work on which has already begun. China insists its programme is for peaceful purposes, but the US defense department has highlighted Beijing's increasing space capabilities, saying it is pursuing activities aimed to prevent adversaries from using space-based assets in a crisis.